Spring Real Estate’s Dutch Office Locations Ranking 2017, published in December, ranked 145 office locations in 34 municipalities on their lettability score. In February, we started with an in-depth analysis of some key markets which will be published on a monthly basis. After the Beatrixkwartier (The Hague) and Beukenhorst (Hoofddorp) we will now analyse Almere. Over the past 20 years, Almere has named the fastest growing city in the Netherlands in terms of economy, employment and number of habitants. Thereby, the city center of Almere won an award for best city center of the Netherlands in the period of 2017-2019. 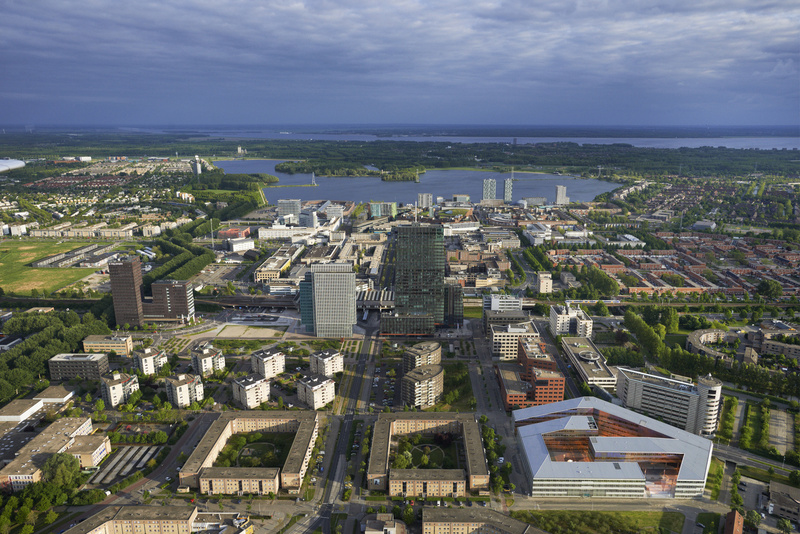 The momentum in the office market of Almere is increasing as well. This is mainly due to developments in the station area with the WTC Almere as landmark, the largest office building in Almere and also the highest WTC building in the Benelux. The momentum is strongly influenced by residential developments. By means of new constructions and transformations, the municipality wants to build 100 to 200 houses near the city center and around the station area on a yearly basis. These residential developments are mainly intended for students, starters, smaller households and expats. The non-occupied office building ‘De Aardbei’ located at Landdrostdreef will be converted to residential. Thereby, Wisselweg 1 and Wisselweg 31 with a total of 13,500 sqm will also be converted for the purpose of residential. In other Dutch cities, the decline of supply by means of transformation has been a driver of recovery. The station area is easily accessible from Amsterdam and Schiphol due to its location nearby the highway A6 and the central station of Almere. Thereby, the location is convenient located near the city center of Almere. As a result, most rental transactions in Almere occur in the station area and several major companies have recently established themselves here. Your Professionals has leased 1,254 sqm office space at Rooseveltweg 11 from the 1st of May 2018 onwards. In addition, Ventolines B.V. will move to the 25th floor of WTC Almere the first of October 2018 by renting 710 sqm office space. Another tenant in WTC Almere, LeasePlan, expands with approximately 1,500 sqm office space. Daisycon is also expanding within the office building Alnovum and extends its lease agreement. A hotel and the restaurant Loetje will be located in the office building Martinez in Q4 2018. In the coming years, the municipality will invest more in the station area by modernizing the central station which is influenced by organizing the Floriade 2022. The information presented is based on Springbase. Do you want to receive the latest quick scan? Please register here.